C&S Peanut Suet Nuggets Wild Bird Food is a tasty bird feed made with corn, roasted peanuts, rendered beef suet, oats, raisins and soy oil. It’s a specially formulated recipe for wild birds that’s perfect when mixed with 5-10 pounds of seed in a traditional wild bird feeder, plus it comes in a resealable bag for easy convenience and freshness. Corn, Roasted Peanuts, Rendered Beef Suet, Oats, Raisins, Soy Oil. Our Nuggets can be fed alone on a platform feeder or in a nugget/peanut feeder. Ideal when mixed with 5 - 10 lbs of seed in a traditional wild bird feeder. This product comes in a resealable bag for convenience and freshness. Suet is 1 of the top 3 foods to feed wild birds. Birds have high metabolic rates, so it is not unusual for birds to consume 1/4 - 1/3 their body weight worth of food a day! Offering suet, mixed with the highest quality grains, nuts, fruits, and flavored pellets provides a high caloric energy source. C&S Suet is 1 of the first foods birds will offer their young. Check our wild bird feeding page for more information on how easy it is to get started. Wild Bird Suet is traditionally fed in vinyl - coated wire cages. They are inexpensive and durable. Wire dimensions vary depending on how starling or squirrel resistant you want your feeder to be. The cages, or baskets, hold from 1 - several C&S Suet Cakes or Bricks. The cages may be hung from branches, tree trunks, or hooks. There are also several designs available combining wire with wood or plastic. View our complete line of Suet Feeders and Baskets. If you have never fed C&S Suet, you have missed some great neighbors. Common birds that eat suet are downy, hairy, red - bellied, and pileated woodpeckers. Chickadees, northern flickers, nuthatches, and starlings are also avid suet eaters. By adding C&S Suet to your wild bird’s menu, you will also attract wrens, warblers, thrushes, brown creepers, brown thrashers, and blue jays. You can also attract orioles, pine siskins, titmice, and the ever popular bluebird. No feeding station would be complete without C&S suet baskets! How do I feed Nuggets? The Bird Nuggets line may be fed with Nugget/Peanut/Sunflower feeders using 1/3? diameter wire or platform feeders. These feeders will only attract the clinging type of bird like Nuthatches and Chickadees. What is a Snack™ Cake? C&S Snack Cakes are produced with natural adhesive binders holding different mixes together in a cake form. These cakes vary in size from 6 ozs to 6.5 lbs. Why would I use a Snack Cake? Snack Cakes create less mess and waste than many conventional seed mixes. Snack™ Cakes may allow you to feed in places that you wouldn’t normally place seed feeders. You’ll also find that Snack™ Cake feeders attract a different type of bird than conventional bird feeders. At first I wasn't sure about these, as none of my birds seemed interested, but once they gave them a try, they seemed to be hooked. These are actually more popular now than my fancy (& expensive!) fruit and nut seed, both of which I serve in wire mesh feeders. My red-bellied woodpeckers particularly love these nuggets! I feed this to the bluebirds who are nesting right now. They love these and the price is better than at the local stores...And delivered right to.my doorstep!!! 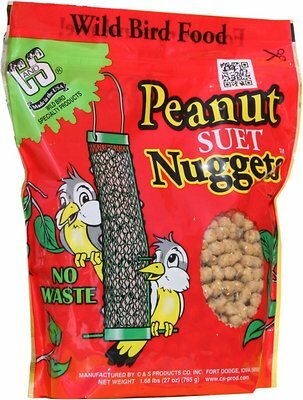 Peanut Suet Nuggets at a Great Price!! Woodpeckers and nuthatches love these. Great fresh nuggets. Good quality and the best price I can find! The large crows seem to love this stuff. They do all kinds of tricks trying to get it out of the feeder that is to small for them to land on. Many different species of birds love these Nuggets (especially crows and blue jays). I will buy again. The birds like suet, but did not touch the peanut suet. The squirrels wouldn't even touch it. I wouldn't give it any stars if I could. Suet nuggets are a hit! All my winter birds love these nuggets....various woodpeckers, wrens, chickadees and sparrows flock to the feeder. I love they are not messy and very easy to pour into feeder. And there’s no waste! The birds outside just Love these nuggets. I put a scoopful out in the morning and all day long I have different birds coming to eat them. Some will take a nugget and fly off with it, others will stay at the feeder and eat the nugget. Yes, birds do indeed love this peanut suet! I’ve had chickadees, two types of nuthatches, red- bellied woodpeckers and even a pileated coming to the feeder. Only problem- keeping the squirrels away.